Whether you are blessed to have a vegetable/herb garden or not, the end of summer signals the time of harvest, the celebration of Sukkot - and food storage for winter! NOW is the time to prepare for those outdoor meals in the tent and so much more! When hummingbirds take flight and the sparrows flock and move south, we find GREAT DEALS on a LOT of organic produce at the markets and grocery store. If you're like me and need to save every penny, love 'almost' fast food from your own well-stocked freezer and want delicious meals in minutes - then it's time to start prepping! Red peppers, mushrooms, sweet corn, even kale, spinach and other greens can be prepared ahead and dried, canned or frozen for fast, healthy meals this winter. And you don't have to build a storage room or root cellar just to 'winter-over' your favorite veggies, either! Although, that is a thought...we just don't have that option. SO, with my food dehydrator, trusty Instant Pot, safe-ceramic stainless steel fry pan and some canning jars - I'm SO ready to start prepping for Sukkot and this coming fall/winter! Please, join me on this journey with this first of several yet-to-come prepping videos that I hope will inspire you to eat better this winter when the wind is blowing and ice has descended from the cold North! 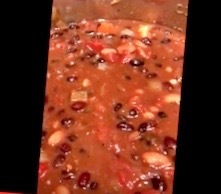 For my delicious Plant-based Vegan Chili Recipe, CLICK HERE!